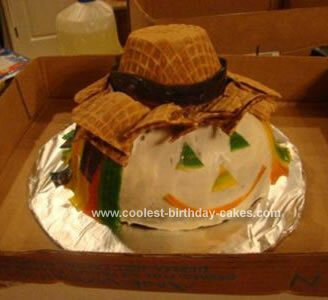 I made this Scarecrow Cake for a church fall cake walk after seeing something similar in a magazine. I used a baking bowl and unfortunately, due to a time issue, used a triple chocolate fudge cake mix. I coated the cake in cream cheese icing, unfortunately also purchased from the grocery store shelf. I used fruit by the foot to make the hair and facial features and ice cream waffle bowls for the hat. I turned the flat side down and cut out a circle just large enough to fit a waffle bowl inside. I stacked 4 or 5 bowls and broke up some pieces to create the brim. To make it a little neater around the hat I added a strand of the fruit by the foot. The cake was a total success and was really adorable. It will definitely be a fall tradition around our house!